A spiralizer is a must-have item in your kitchen for its versatility, creativity and nutritional benefits. The Oster® Electric Spiralizer turns healthy vegetables into delicious spirals in seconds, unleashing the potential of the fresh and tasty meals you can create. Spiralized pasta dishes are all the rage, and for good reason - they're delicious and totally nutritious. Cut down on your carb intake by replacing traditional pasta with vegetable spirals. 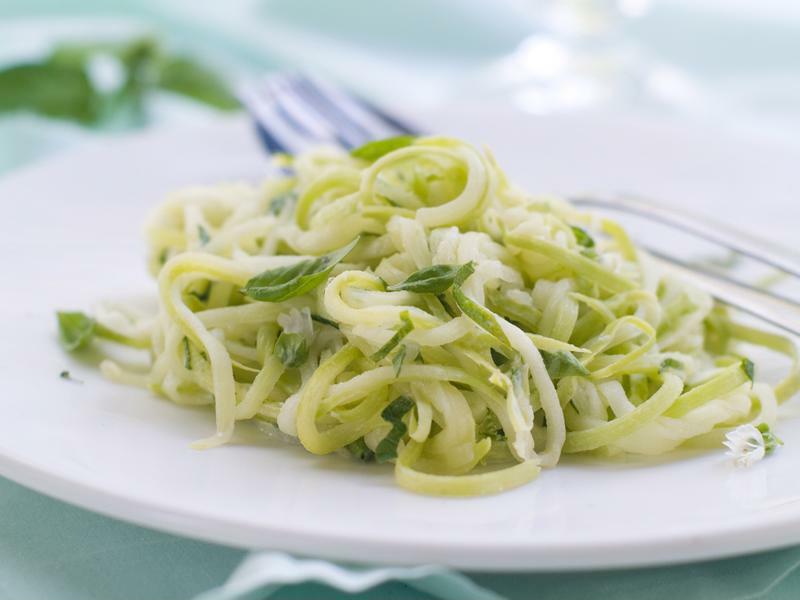 Zucchini spirals are a great pick for pasta dishes because they have a firm consistency, making them a great noodle replacement. You can make spiralized versions of all your favorite pasta dishes, from carbonaras to al fredos - the options are endless! Veggie pasta dishes can also be cooked up much faster than regular pasta, making them a great idea for active lifestyles. All you have to do is toss your vegetable spirals with olive oil, sauces, grated cheese and even chopped meats or additional veggies. Heat the "pasta" on the stovetop to warm, then enjoy your delicious meal. Got picky kids that turn their nose up at vegetables? The Oster® Electric Spiralizer is the solution. When vegetables are transformed into colorful, fun spirals, kids can't get enough of them! Kids can enjoy the spirals on their own with a light dressing, or they can be enjoyed mixed into other dishes, like lasagna. With the Oster® Electric Spiralizer, you can help ensure your kids get the important nutrients they need from vegetables. Zucchini spirals make a great pasta replacement. The Oster® Electric Spiralizer can make eating gluten-free or vegetarian dishes easier and even more delicious. Vegetable spirals can be used in place of noodles or other carbs and starches in stir-fries, pasta, soups, casseroles and more. With a spiralizer, you have the culinary creativity and freedom to transform a variety of meals into tasty and fresh versions that fit your diet. Add some more excitement to your dinners by making spiralized side dishes. There are so many side dishes you can create that you'll never run out of ideas and mealtime will always be interesting! Try tossing carrot spirals in a light Thai peanut sauce, or mixing zucchini spirals with lemon juice, olive oil, garlic and herbs. Whatever the dinner, from grilled chicken to shrimp, there's a healthy spiralized side dish that's the perfect match! Packing nutritious, balanced work lunches is an essential part of healthy living. You won't ever be tempted to grab an unhealthy lunch out with the Oster® Electric Spiralizer. Instead of a plain salad, you can look forward to eating a vibrant, vitamin-packed salad made from veggie spirals. Just mix the spirals with chopped fruit, vegetables, nuts and low-fat cheese and you'll have a work lunch you'll look forward to eating, even five days a week! Veggie spirals also add crunch to sandwiches, substance to soups and extra flavor to cold pasta salads, so start adding them to your lunch menu today. With the Oster® Electric Spiralizer, you can unlock the culinary creativity to make healthy and fresh meals every day.